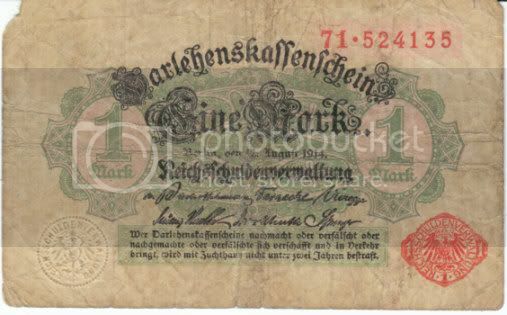 10 sen note issued c1917-21 during World War I. 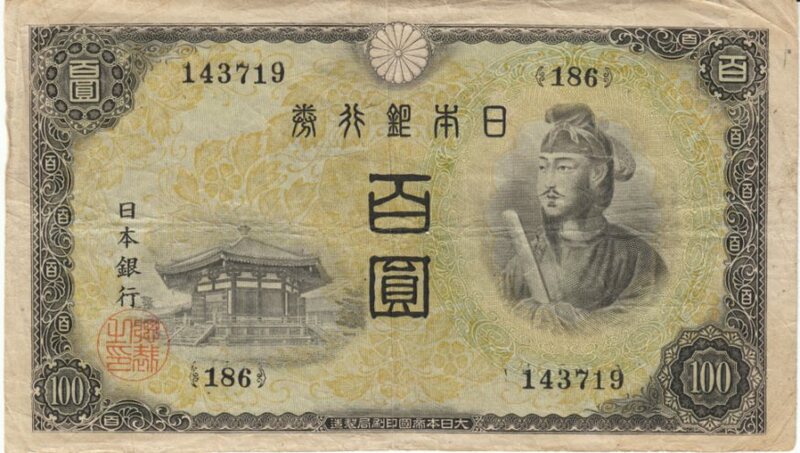 This Great Imperial Japanese Government 'Paper Money' issue also came in 20- and 50-sen denominations. there was a 20-yen coin but otherwise it seems there really wasn't a whole lot of money in circulation in Japan in the late 1910s. 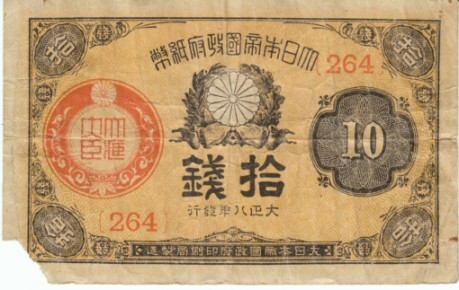 The 5 and 10 yen notes issued in 1930 and replaced in 1942. 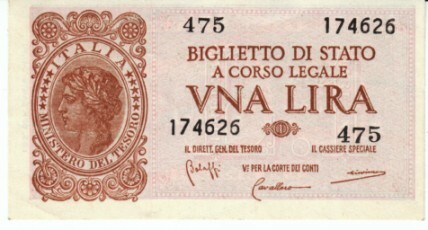 This 1 lira note was issued in November, 1944; Italy had capitulated but the war raged on. It is rather small, measuring 78mm x 42 mm, and came in 2-, 5- and 10-lira denominations, too. 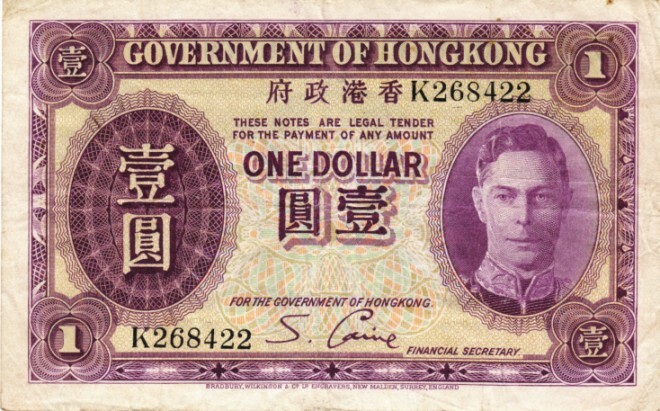 The Hong Kong 1 Dollar bill issued in 1936 in use when the war began and replaced with a blue one like it in 1940 or '41. 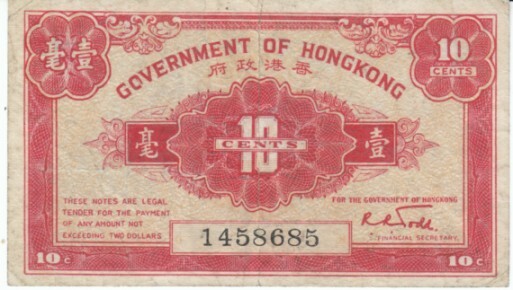 The Hong Kong 10-cent note issued in 1941. Again, this small denomination bill was not valid for amounts more than 2 dollars. 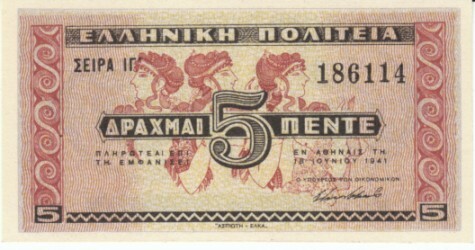 The Greek state's 5 drachma issue from June, 1941. Things were still not too bad for the economy. 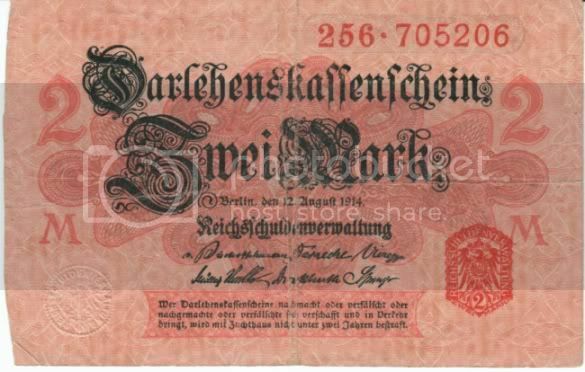 this 5 million drachma note issued by the German occupiers in 1944 shows how quickly things can spiral out of control during a war. 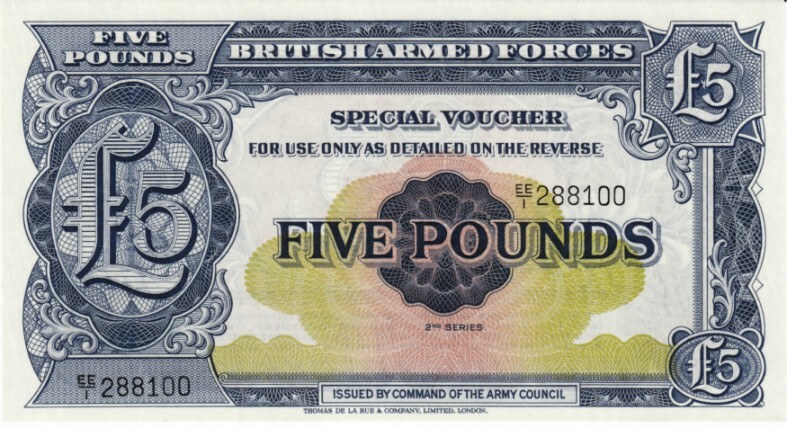 The First Series of the UK Armed Forces Special Vouchers used in military canteens, with certain organizations and other special uses by military personnel. 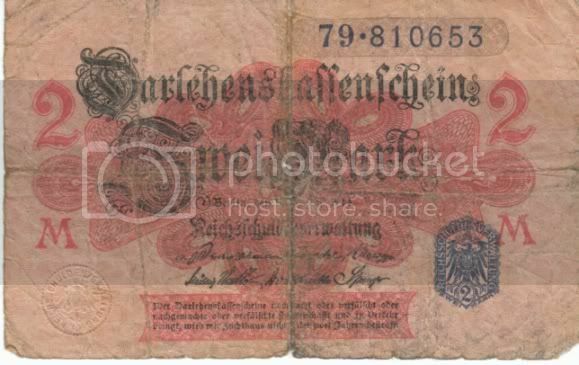 This note was issued in 1946 for use by British forces occupying German and Austria; in 1947 it was used by occupying troops in Japan. 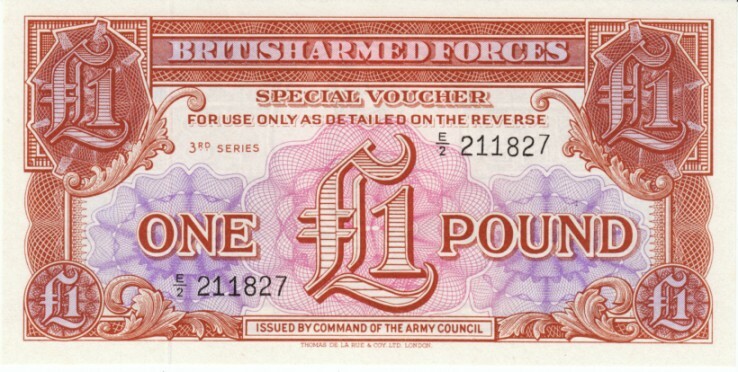 The Second Series was issued in 1948 and removed in 1971. It was used world-wide by British forces. 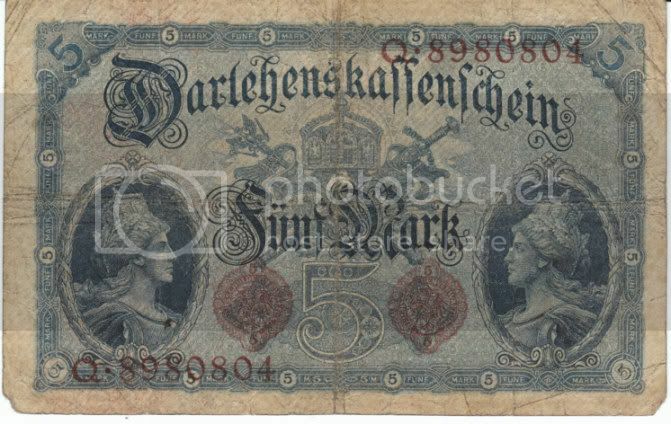 The Fourth Series was issued in 1962 and replaced by the Fifth Series soon thereafter. Monty, are you referring to different local banks issuing 'local' money? (yes, State banks did this until early 20th century). Silver certificates vs. gold certificates? (yes, we had paper money backed by silver and some backed by gold. By 'backed' I mean you could take the paper money into any bank and get silver or gold coins of equal value for it.) Not sure I follow what the question is. My comment about it being hard to take this type of money seriously refers to 'this note will be exchangeable in 2 years time' type of conditions put on the value of the paper money. It's done in war time, sometimes, but otherwise is more like a ponzi scheme. 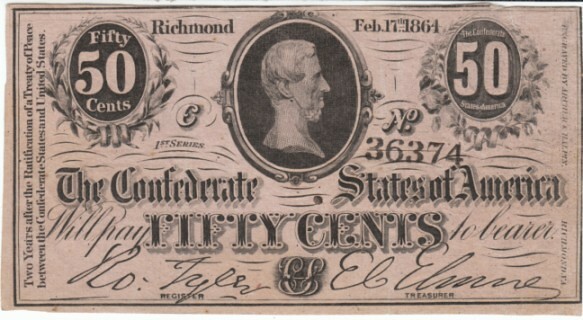 My only example of Civil War money is this 50 cent note from the Confederate States of America ("the South") and dates from 1864. 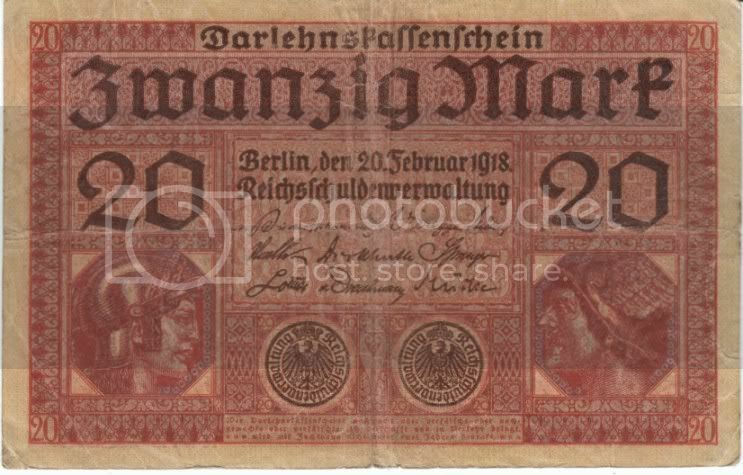 The text on the left edge says that this money can be redeemed (for silver coin) 2 years after the peace treaty; the assumption is that after the South wins the war--or at least gets recognized by the North and the fighting stops--this money would be turned in for "real money", ie. silver. 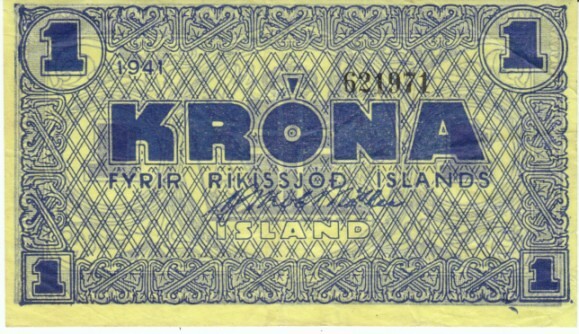 It's hard to imagine taking this type of currency seriously, but this sort of condition is often used e.g. 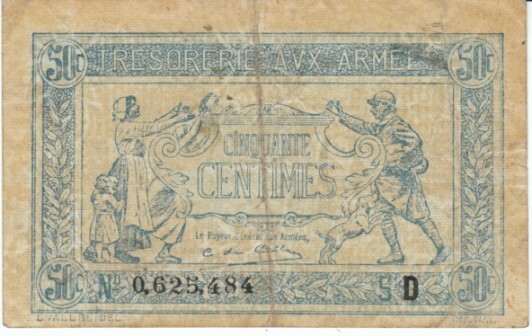 see the French WWI money above. 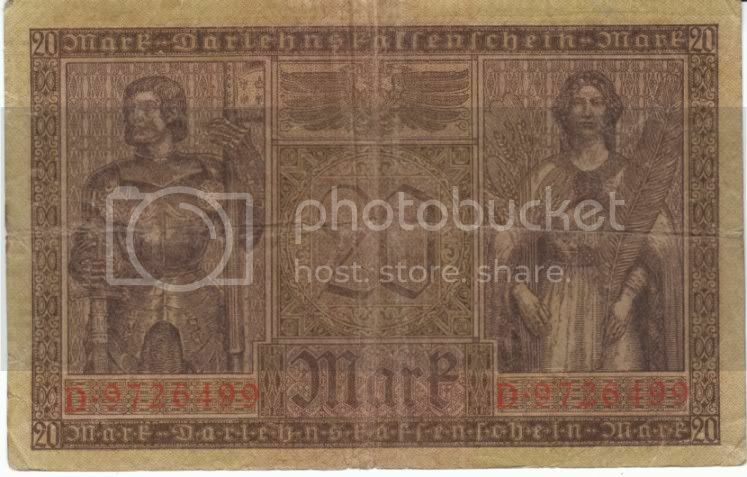 Here is the 1-mark and half-mark banknotes from the early West German government, the Federal Republic of Germany. 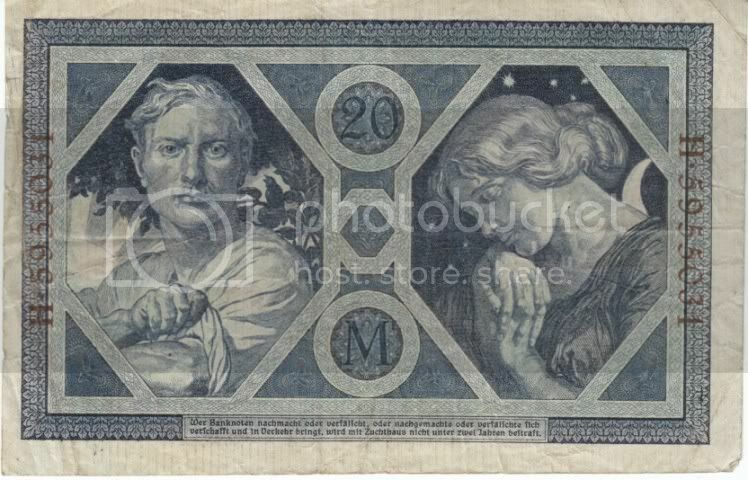 The 2-, 5- and 10-mark bills are like these pictured above; the 20-, 50- and 100-mark notes are a lot like US money design. 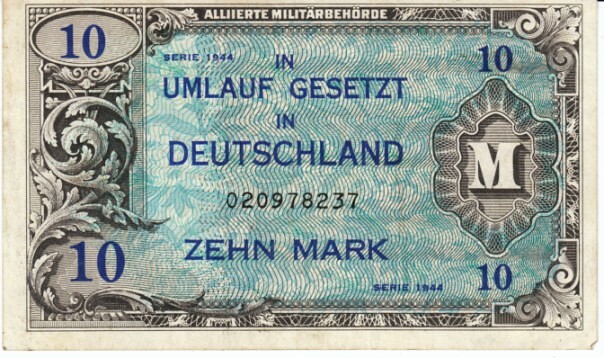 As seen up-thread, the Allied occupation governments issued special currency for the defeated Germany. 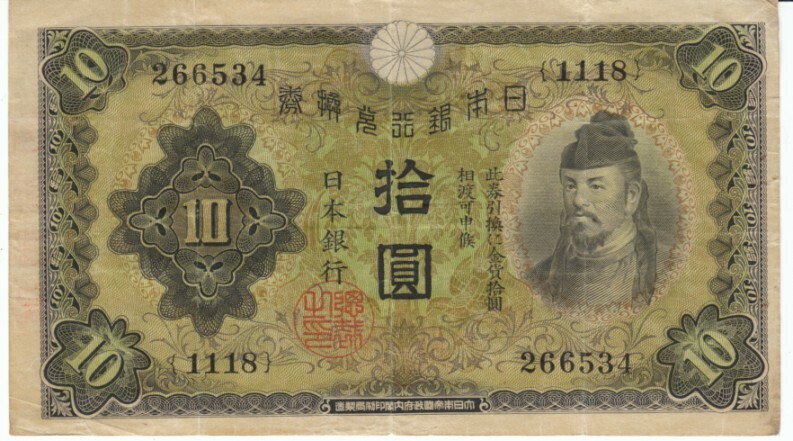 (Italy and Japan got similar treatment with very similar-looking banknotes.) Pictured above are the 5-, 10- and 50-mark denominations of this money. 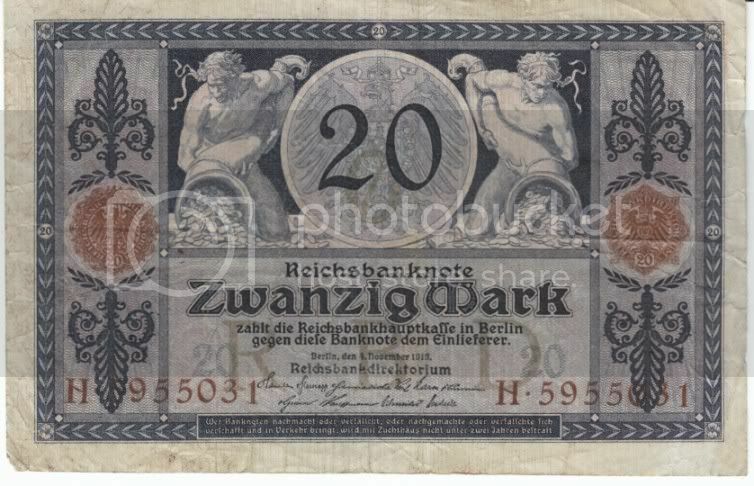 These notes were issued in 1929--after the hyper-inflation had been tamed but before Hitler's government took over--and show the 20- and 50-mark notes. The 20 shows Werner von Siemens, the 50 David Hansemann. 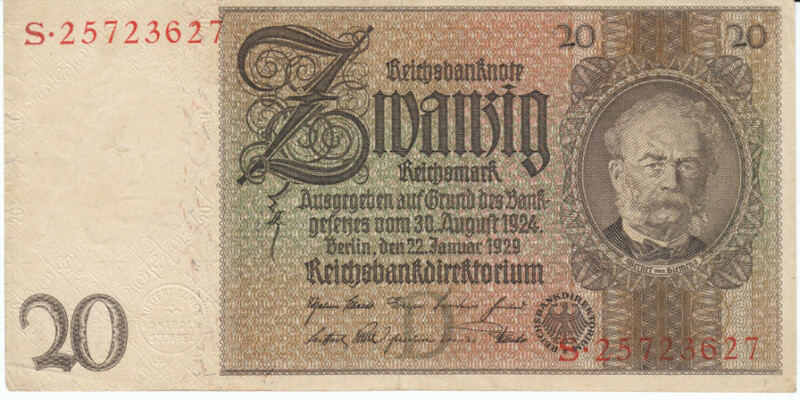 The 20 was replaced in June, 1939, while the 50 was in use throughout the war and even re-issued (with some text added at left) in 1945. 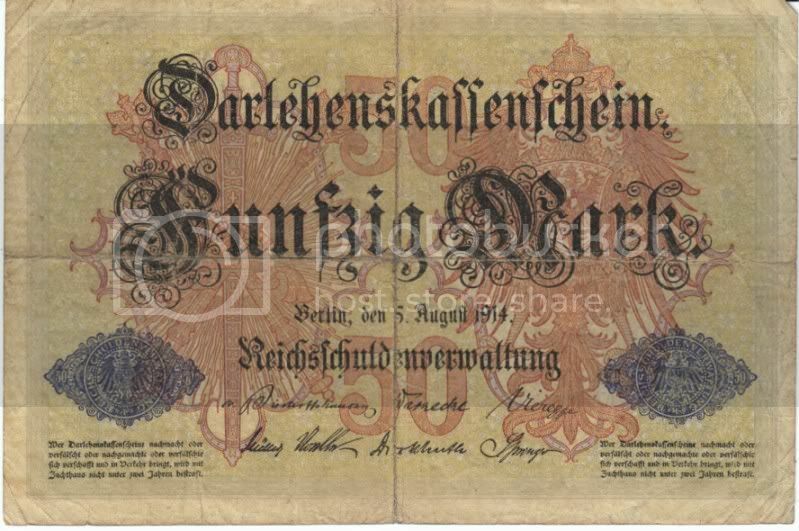 Both of the above notes are considered military notes. 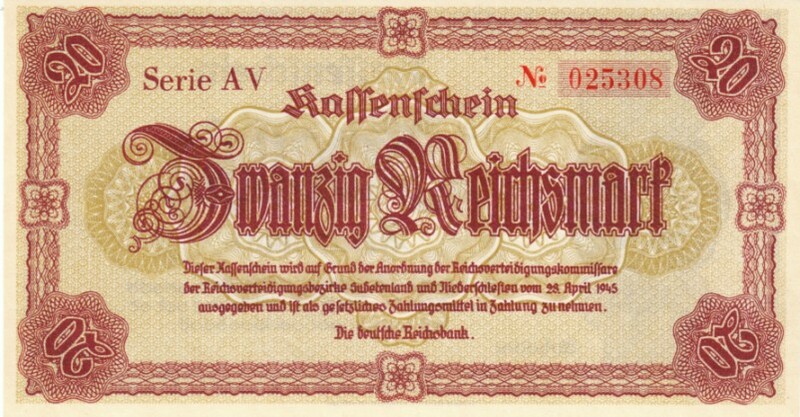 The 5 reichspfenning is an Auxilary Payment Certificate for the German Armed Forces and was issued in 1942. It is uniface (has a blank back.) 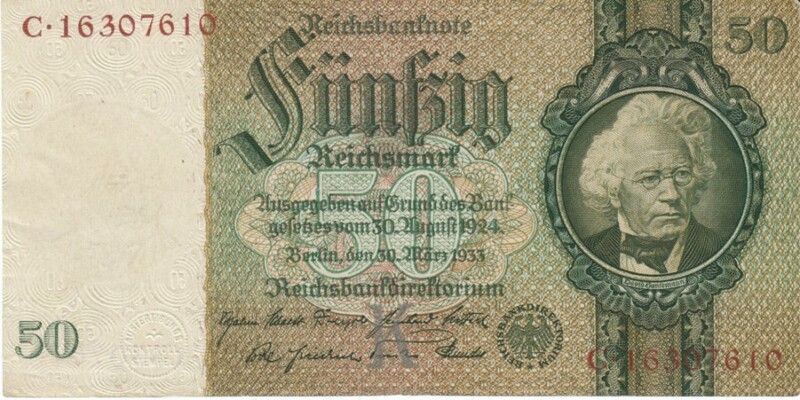 The 1 reichsmark note is a Clearing Note for German Armed Forces and was issued in September of 1944. I am not sure what the purpose of a 'clearing note' was. 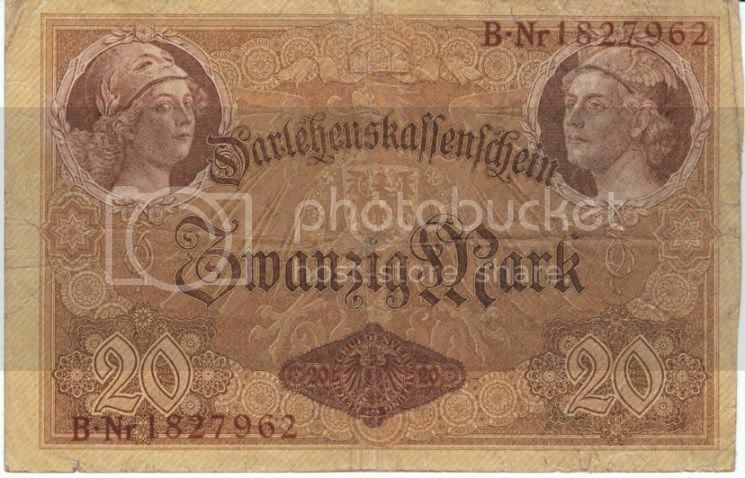 This 20 reichsmark note was issued for use in Sudentenland and Lower Silesia in April 1945. 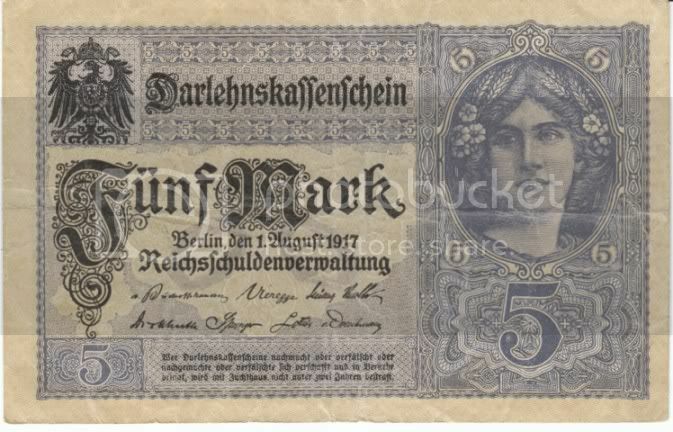 Finally, this 5 reichsmark note was issued for use in occupied territory and could have been seen circulating along with the local national currency. It dates from 1940-45. 1916 issue of Lithuania occupation State Loan Bank Currency--50 kopeck denomination; others were 20 kopeck, 1-, 3-, 10-, 25- and 100-rubels. the next two are quite beautiful and I'll show both the front and back. 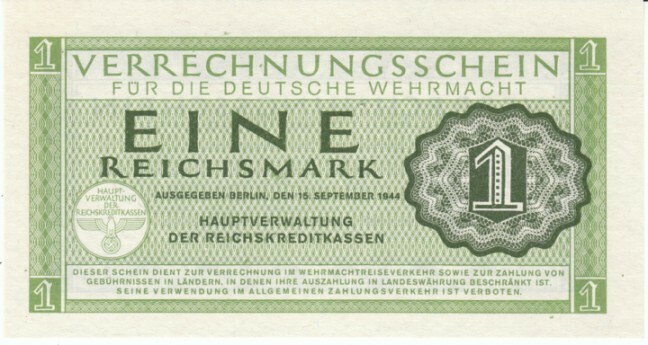 The first is the 20-mark version of the above 1917 issue. the next one is the Imperial Bank note for 20 marks issued in 1915. 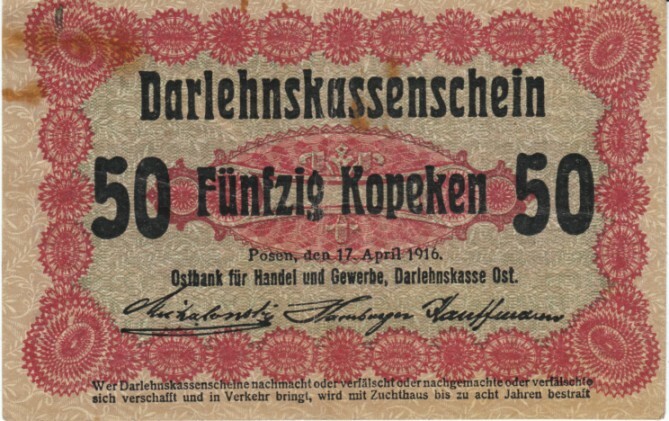 The first Darlehenskassenschein (State Loan Currency Note), 5-, 20- and 50-mark notes issued August 1914. 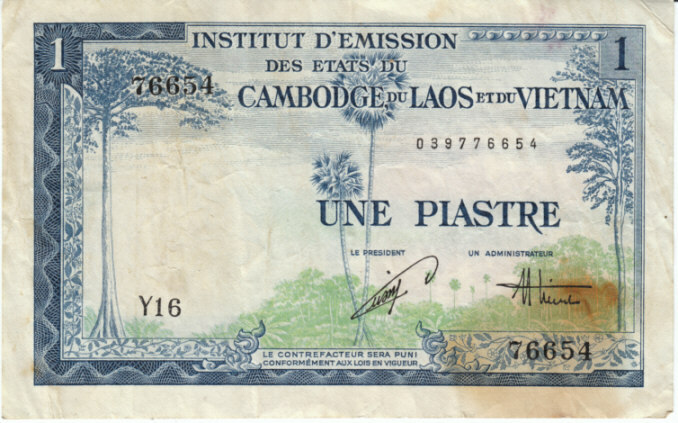 These 2 pieces of paper money were in circulation when Vietnam gained its independence from France. 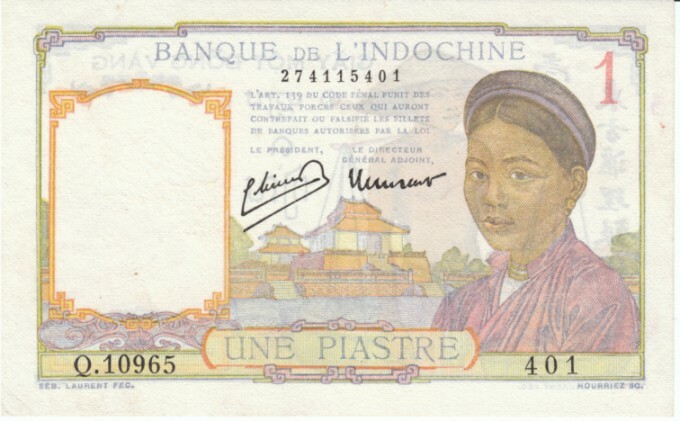 the 1 piastre note of 1953 with Bao Dai at center. 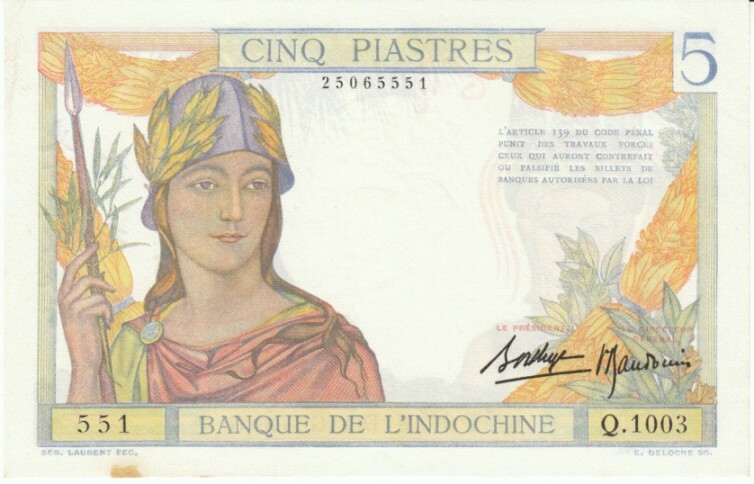 The 1954 1 piastre note. 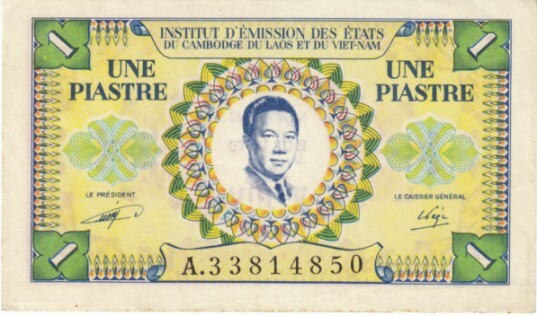 the 'Institut d'Emission des Etats du Cambodge du Laos et du Vietnam' was the money-issuing agency which formed after WWII when France granted some independence to French Indo-china and the resulting smaller areas were members of the French Union. 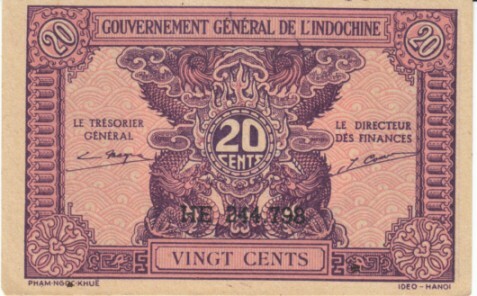 The late-1930s 1 and 5 piastre notes from French Indo-china (Vietnam,Laos and Cambodia) issued by the Bank of Indo-china. 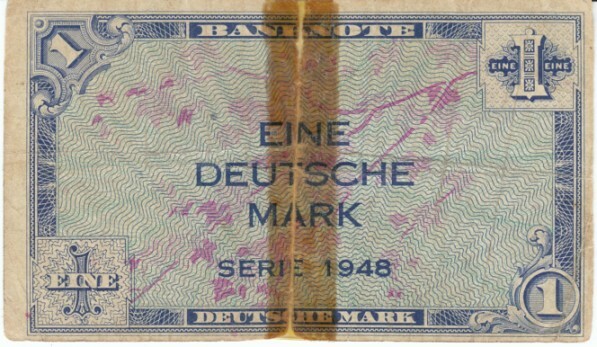 The 1 piastre note has the 1946 signature variety but otherwise is the same as that issued in 1936 and used through the initial years of the war. 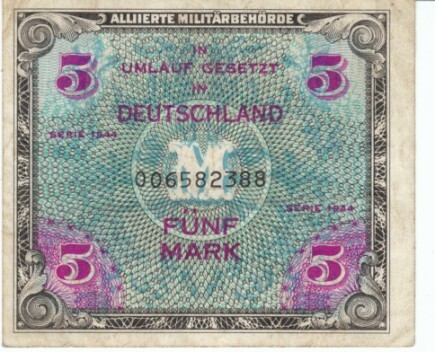 The 5 piastre note was issued in 1936 and remained the same throughout the war. 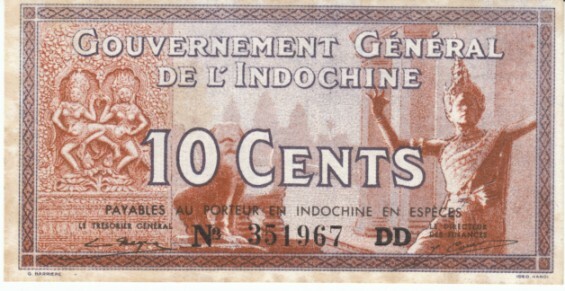 Gouvernement General de l'Indochine banknotes of 10 and 20 cents issued in 1939. 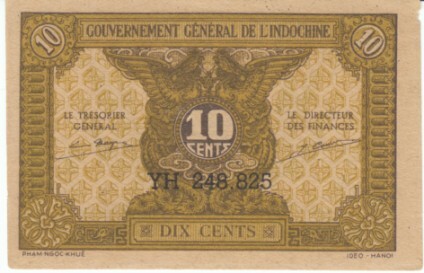 I believe these are Vichy French issued notes. 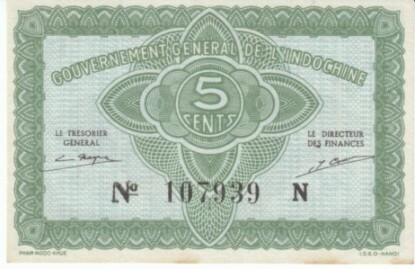 The Government General changed the design in 1942. Here are the 5-, 10-, 20- and 50-cent banknotes. These were the only denominations issued in this series. Thanks, Monty! Yes, better late than never. 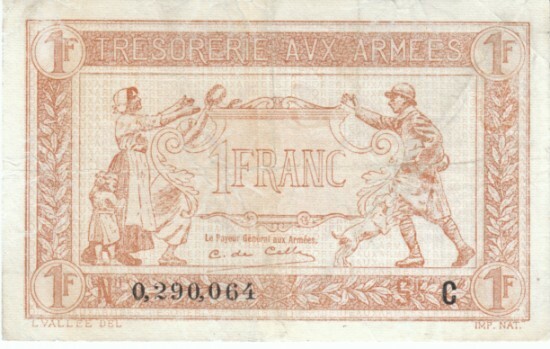 Issued during World War I, these French Army Treasury notes were issued in 1917. 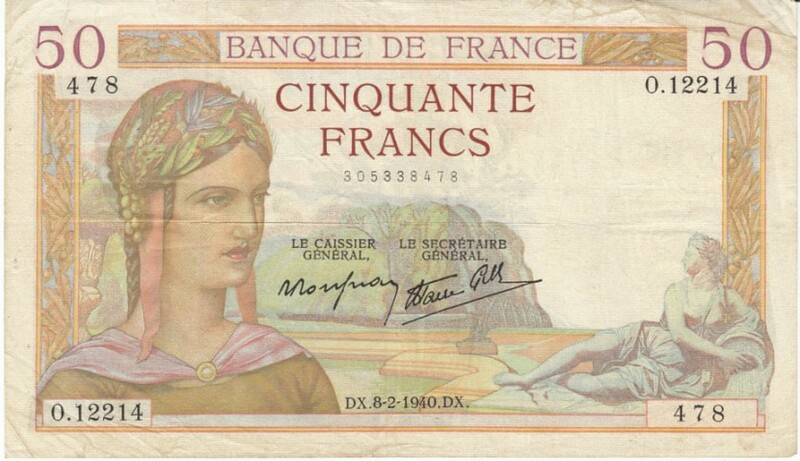 They were valid with French and Allied military cashiers and in regular banks in designated areas. They expired after the 2nd year of the peace (whenever that would end up being.) A second series was issued in 1919 "good until the end of the 4th year after the Armistice." 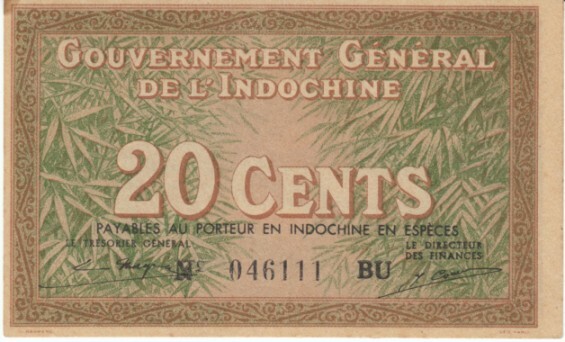 The 1917 series also came in a 2 francs note. 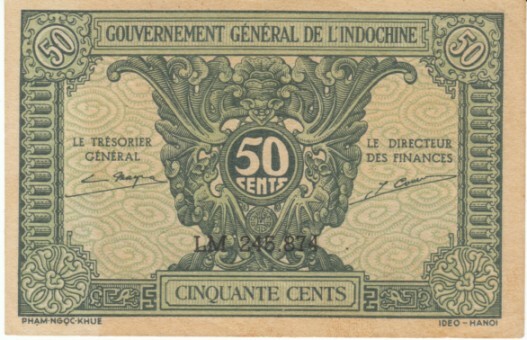 The French 5 francs note dated December 23, 1943. 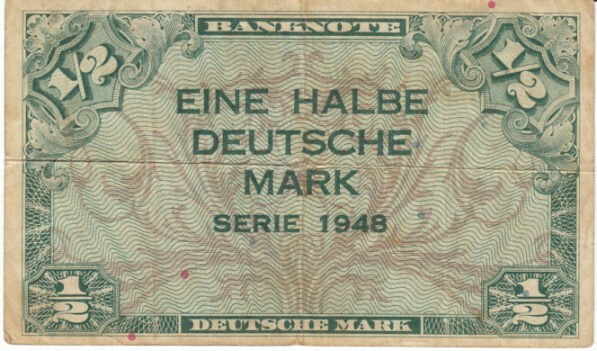 There are many dates printed in the line at the bottom otherwise the design remained the same from 1943-47. 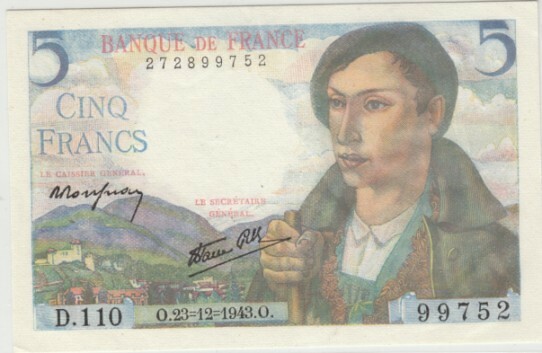 The 50 francs 1944 note, called Allied Military Currency or Supplemental French Franc Currency. This one differs from the one posted before in the wording at the sides: "Emis en France" [issued in France] as opposed to just "FRANCE"